Do you remember that movie The Incredible Shrinking Woman, starring Lily Tomlin? I saw it when it came out- I must’ve been about twelve. The movie’s premise is that suburban housewife Pat Kramer (Tomlin) gets exposed to some experimental chemicals and consequently begins to shrink: she shrinks to her children’s size, and later she is living in her children’s dollhouse. Kramer ultimately shrinks to microscopic size, landing in a puddle of household chemicals, which- luckily!- cause her to begin to grow again. The last scene of the movie is of Kramer, at her normal size, looking down to see her shoe splitting open. Kramer and the audience realize at the same moment… now, she is continuing to grow. This movie scared the crap out of me as a kid. Thirty years later, instead of watching Lily Tomlin get chased by mad scientists, I can scare myself silly by simply reading about actual chemicals in our environment to which we are exposed each and every day: Phthalates, Bisphenol A (BPA), Triclosan, Mercury, Teflon, Brominated Flame Retardants (PCBs, PBBs, PDBEs) and Pesticides (DDT and 2,4-D). 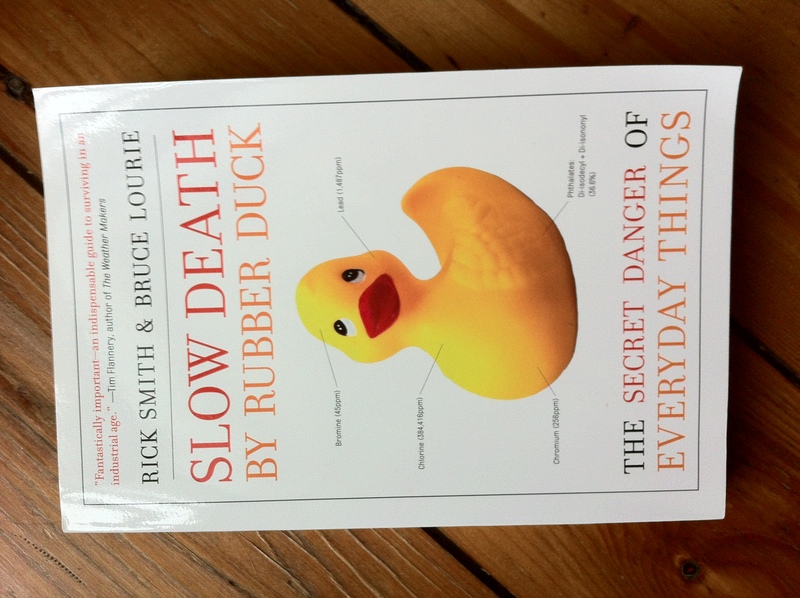 Recently I finished Slow Death by Rubber Duck, which is all about the chemical soup in which we collectively marinate as a society. But authors Rick Smith and Bruce Lourie go one better than just writing about the omnipresence of these chemicals in our everyday environment- they also chose to experiment on themselves. Over the course of a few days they exposed themselves to “normal” levels of common everyday chemicals to see what levels of them would later be traceable in their blood and urine (such as eating a tuna fish sandwich or sitting on a stain-resistant couch). The implications of what they found are perhaps even more scary than the prospect of shrinking to the size of a molecule on your own kitchen floor. The more you try to avoid or eliminate them, the more insidious you realize their infiltrations to our everyday life have become. It begs the question: do we have to go live under a rock to escape the health hazards of modern life? I mean, I’m starting to feel a little surrounded here. Sometimes it seems to me that the price of being a member of contemporary society is, knowingly or not, to put our very lives on a roulette wheel. After reading Rubber Duck, my husband and I were inspired to get rid of our Teflon pans and replace them with a non-Teflon alternative. At the nearby kitchen store we were sold some pricey “Swiss Diamond” pans which were promoted to us by the salesperson as a great non-stick alternative to Teflon. Later I wondered why, however, the literature that came with the pans was very careful to avoid saying the pans were Teflon-free. Wouldn’t that be a selling point? Something was fishy in Denmark… or perhaps Sweden. After some online research the truth came out: Teflon by any other name… is still Teflon. PFOA is what they use to bond to the diamond in the Swiss Diamond pans. Which is… Teflon. Under its non-trademark name. So here’s my question: why is it that we, non-chemistry majors most of us, are required to sleuth out that “PFOA” is the same thing as Teflon, and that “fragrance” is code for pthalates, that juice is just as bad for you as soda and that sugar is what is making people fat, not fat? Whenever I find out one of these things for the first time, my first reaction is always the same: why didn’t somebody tell me this sooner?? Why don’t more people know this? There are plenty of people being paid very well to argue that the status quo is fine, but is there really no one out there looking out for us? Who is our lobbyist? In the end, even though the fake-No-Teflon pans had been used, we explained the situation and the kitchen store nicely allowed us to return them for store credit. This we promptly used to buy a large cast iron pan, the kind great-grandma would’ve used. It’s huge, requires some special cleaning instructions (No soap! Special scrub-brush! Dry immediately to avoid rust!) and is incredibly heavy. It isn’t what most people would consider “convenient” in our no-muss, no-fuss, flame-retardant, lavender-scented and oh-so-sweet world. But you know what? I’m starting to think that convenience is in the eye of the beholder. Yes, I recently went back to the cast-iron pans that I would bug my own parents about! One thing that also helps is to swipe the pots with some oil after they’ve dried. Also, get some pan scrapers – they’re a lifesaver. If those can’t get the food out, then make sure to soak the food in some oil overnight. Believe or not, I actually don’t miss the teflon anymore! My mother used to put any just washed rustable cooking dishes into the still-warm oven to dry fully. As long as they are stored in a dry place there will be no rust. I really feel you on this! “Conventional Wisdom” has us doing or accepting so many things that in actuality are not in the least bit wise or sane, and they become so ubiquitous that it becomes harder and harder to avoid all the things that are actually really bad for you. XD Sometimes I can’t believe the hoops we have to jump through to live what should be a normal, healthy life. We’ve switched to cast iron pans here as well! They may be heavy and a bit inconvenient, but they’re so much better, and honestly, I feel that the food tastes better when cooked in them too. For another ubiquitous but scary thing – check your shampoos, soaps, toothpastes, laundry powders and other cleaning products for Sodium Lauryl Sulfate and Sodium Laureth Sulfate. SLS is in 95% of those products – but it’s a petroleum based industrial grade cleanser used for scouring warehouse floors and the like. XD Its only purpose in household products is to create more lather so that you feel like you’re getting a “better” clean — but a lot of people are actually quite sensitive to it. I had really awful dandruff/itching on my scalp, chronic eczema on my face, and irritated gums that bled every time I brushed my teeth, and ALL of these problems cleared up when I cut out products with SLS in them. I’ve heard a lot of people with the same problem, and some companies are finally cluing in and marketing SLS-free products now. But I had to figure this out myself by doing research on the net — no doctor, dermatologist or dentist ever thought to suggest it, and I’ve seen plenty. It’s true – why is there nobody out there lobbying for us? Why do we have to find this stuff out for ourselves only after doing exhaustive research? Who are we meant to trust to be honest with us? I bought a new pressure cooker /slow cooker combo made by Breville. I didn’t check on the inner “bowl” when I bought it, and now find it is Teflon coated. It’s going back to the shop tomorrow. I just imagined it would be like my old pressure cooker inside, silly me. You are currently reading A Year Of No Sugar: Post 82 at Eve O. Schaub.